This pretty tune appears on the album Swinging, Singing, Playing by the Count Basie Orchestra. One of only a handful of Basie alumni playing with the band, trombonist and arranger Dennis Wilson does a nice job of capturing the vibe and easy swing of the old orchestra. To me, this song calls to mind the Basie records of the late 50s, when Thad Jones was writing and arranging for the band. Wilson says he wrote this the day Basie died in 1984. This entry was posted in Uncategorized and tagged Basie, Dark Morning, jazz, lead sheet, music, Noteheads, transcription on June 25, 2018 by noteheads. Here’s a fun jazz calypso from McCoy Tyner. This entry was posted in Uncategorized and tagged Island Birdie, jazz, lead sheet, mccoy tyner, music, Noteheads, transcription on June 18, 2018 by noteheads. A pretty ballad by saxophonist Tom Scott. 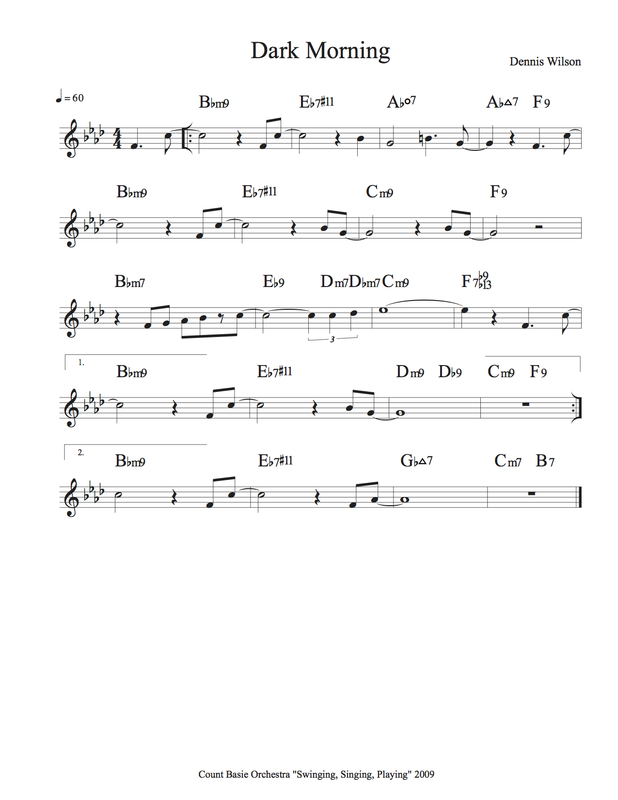 This entry was posted in Uncategorized and tagged jazz, lead sheet, Love Poem, music, Noteheads, Tom Scott, transcription on June 11, 2018 by noteheads. I transcribed this from a mix CD given to me about ten years ago. I’ve learned it comes from an Eric Reed album called Blue Monk, but I don’t know who wrote the song or when. Is anyone familiar with this tune? This entry was posted in Uncategorized and tagged Blue Rose, Eric Reed, jazz, lead sheet, music, Noteheads, transcription on June 4, 2018 by noteheads.